The Corporate Social Responsibility (“ CSR”) initiative at Sony Pictures Networks India Private Limited (hereinafter referred to as the “ Company”/ “ SPN”) draws on our philosophy that as a responsible organization we will contribute to the greater common good of our community and society and help build a sustainable way of life for marginalized sections of society. Our Vision is – ‘To be conscientious in all our actions and create positive change in the society we live in’. This statement gives a sense of purpose to all our endeavors. (xii) Such other activities as may be notified by the Central Government and approved by the CSR Committee. d) Company in collaboration with other like-minded companies either directly or through trust/society /Section 8 company operating in India. The entities other than the Company as specified above in b, c, and d shall be hereinafter referred to as “Partner Organization”. The Company believes in being employee-driven in its approach and will encourage its employees to actively engage in CSR Activities voluntarily as part of their individual contribution to the community (“ Volunteers”). 4.3 CSRC will recommend the amount to be spent on CSR Activities on a financial year basis. If the Company decides the planning and/or implementation of CSR Activities in any financial year with collaboration of Partner Organizations as specified in aforesaid Section 3, then the Company will select its Partner Organizations in accordance with the guidelines as given in Annexure A to this policy. The planning and execution of the CSR Activities will be done in a time bound manner. (iv) Submitting periodic reports to the CSRC through the Permanent Invitee. - A quarterly report as specified in Annexure B will be prepared by the CSR Head at the end of every quarter and submitted to the CEO. - An annual report of the CSR Activities in the format as specified in Annexure B of this policy will form part of the Report of the Board of Directors. All initiatives undertaken by the Company will be transparent and shall be shared with its various stakeholders. Any surplus arising out of the CSR Activities shall not form part of the business profit of the Company and will be used only for CSR activities. The Management of the Company is committed to being socially responsible and bringing a positive change in the community in which we operate. A seven-point selection criterion is to be used for selecting a Partner Organization. (v) Such other laws as may be applicable. The basic infrastructure of the Partner Organization should be in place and in a functional condition. This includes offices and centres (owned or rented), office equipment, etc. This check is fundamental to ensure that there is more to the Partner Organization than just a website. This necessitates a visit by SPN CSR Head and/or Volunteers to the premises of the concerned Partner Organization. To ensure better accountability, the organization should have a clearly defined staff structure including number, names, roles and responsibilities of the staff etc. involved in the project, Partner Organization's capacities, staff experience and expertise in the context of the proposed project and otherwise, geographical area covered by the organization, other projects undertaken by the Partner Organization. The Partner Organization must furnish information about its promoters and other stakeholders. (i) Has pending legal disputes and or enquiries in connection with offences like cheating, misappropriation of funds, exploitation of beneficiaries, etc. (ii) Is blacklisted by any government agency. A self-declaration w.r.t. (i) & (ii) is required to be submitted by the organization with other necessary documents at the time of finalising the project. The most important criterion for the selection of a Partner Organization is how well it fits with SPN’s CSR philosophy. 1) A brief outline of the Company's CSR policy, including overview of projects or programs proposed to be undertaken and a reference to the web-link to the CSR policy and projects or programs. 2) The Composition of the CSR Committee. 3) Average net profit of the company for last three financial years. 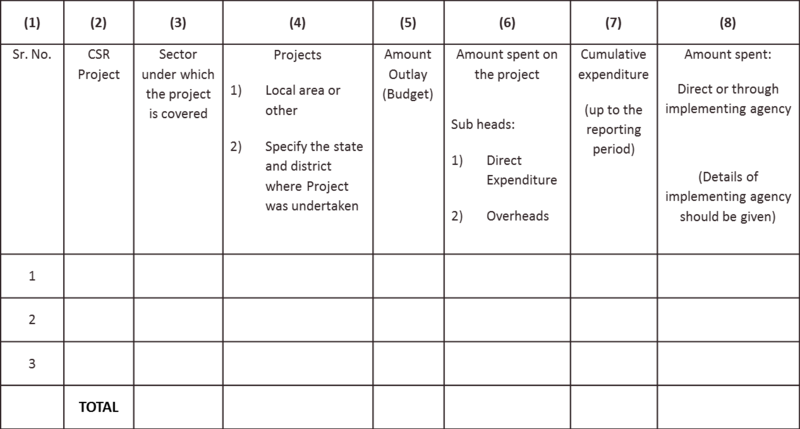 4) Prescribed CSR Expenditure (2% of the amount as in item 3 above). 6) In case the Company has failed to spend the two (2%) per cent, of the average net profit of the last three financial years or any part thereof, the Company shall provide the reasons for not spending the amount in its Board Report. 7) A responsibility statement of the CSR Committee that the implementation and monitoring of CSR policy, is in compliance with CSR objectives and policy of the Company.